Here is how the sunday after Valentine's day went. Wake up, make an enriched yeasted dough, let it rise, cut into long strips, and let it rise some more. Grind hazelnuts, melt chocolate, and make a chocolate hazelnut custard (do you see where I'm going with this?). Strain said custard five times over, realize it is nearly impossible to strain the hazelnut meal out of the custard for a smooth texture and yell because chocolate hazelnut donuts will no longer be happening today. After moping around for a few minutes, come to the conclusion that hazelnut milk is the missing key, think long and hard about where to buy hazelnut milk. Realize: nowhere. With a sigh of defeat for the day, get lovely boyfriend to make a second trip to the store in single digit temperature for more hazelnuts and lots of cheesecloth. Start the process to make hazelnut milk. Pour and drink bourbon. Daydream about the day recipes come out right the first time around. Milk has always been one of those things about which I have been less than enthusiastic. Milk and cookies? No thanks, I'll take a glass of water please. It's strange because so many great things come from milk: butter, buttermilk, cream, yogurt, cheese, and by extension: pasta, cakes, pies, ice cream, biscuits, milk chocolate! However in its unadulterated form it is just so...boring, even slightly repulsive. Having tried a few mainstream store bought nut milks in an attempt to circumvent my general dislike for milk, I always found them to be even worse. Too thick, too sweet, and nothing like the kind of stuff you would want to drink on a regular basis. 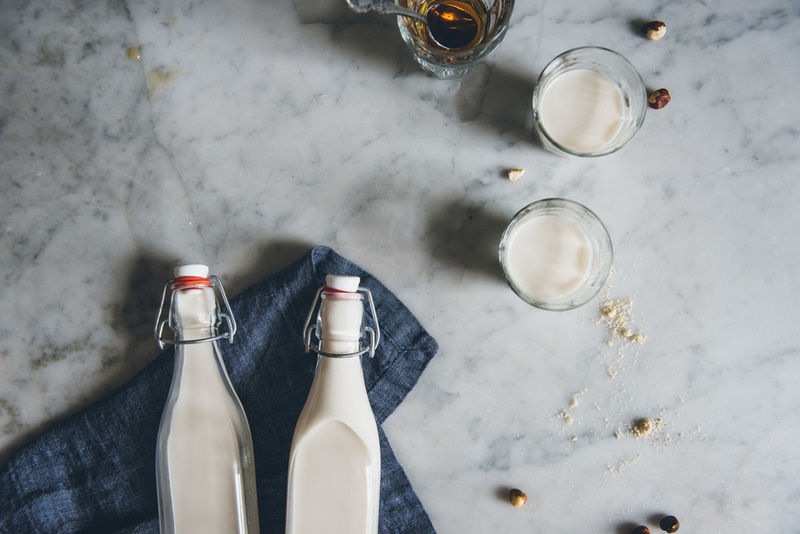 Now, with the discovery of homemade nut milk, things have changed. I had originally intended to make hazelnut milk only once, out of necessity for those donuts I so dearly wanted (spoiler alert: donuts still didn't turn out, more on that later). However, after having a few glasses at the insistence of no one else except for myself, I would not object to it making a regular appearance in our kitchen. The amount of water you use is entirely up to your preference. It depends on whether you prefer a creamier, more concentrated flavor or something a little thinner. Yields 1 to 1.5 quart(s) milk. Toast hazelnuts at 375 degrees F for 8 to 10 minutes until just fragrant and the skin starts cracking. Let cool to room temperature then peel off as much skin as possible. Transfer to a large jar, add water so the hazelnuts are completely submerged plus a few additional inches since the nuts will expand as they soak. Cover and let sit overnight at room temperature. The next day, drain and rinse hazelnuts. Transfer to a blender along with filtered water. Blend until smooth and milky. Line a large sieve with 3 to 4 layers of cheesecloth. Strain the mixture. Once most of the liquid is strained, wring the cheesecloth to get the remaining milk. If not using immediately, store in the fridge in a sealed jar or bottle. Add in any sweetener you're using as needed right before consuming.